Ceilings are typically painted white for good reason. It brightens the space and gives the illusion of a higher ceiling. For rooms with low ceilings or ceilings under nine feet, white is an essential color. However, for rooms with higher ceilings, adding unexpected color to the ceiling can be a great decorating technique. Color on the ceiling does not necessarily mean painting it blood red or cotton candy pink. Ceiling color is more subtle in its attempts to draw the eye. Adding hints of color can raise the eye and create a beautiful focal point in the room. Still unsure if ceiling color is appropriate? Think about old cathedral ceilings painted with murals and how the use of color on the surface overhead provides visual interest, as well as, highlights the room. Although the addition of ceiling color in the home will usually not be as drastic as the chapels of old, it can create a beautiful look and feel to the room. When adding ceiling color, it is important to know where it is going to go, and what the pattern will look like. Some color additions need very little planning. For instance, a painting trick to lengthen the appearance of the room’s walls is to paint a six inch border around the ceiling in the same color as the walls. This gives the illusion that the walls are taller than they actually are. To map out this technique, a straight edge ruler and pencil are all that are needed. 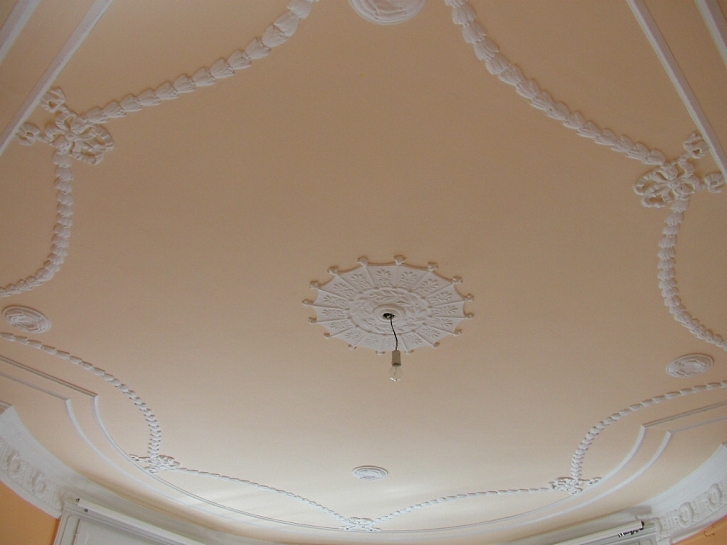 If, however, the design will be swirls or delicate branches, it is best to sketch out the design on paper before attempting it on the ceiling. Painting ceiling designs can be challenging, as you will be stretching and looking up, so a well thought out plan is always a good way to start. Even if the design will be painted freehand, map out on a sketch pad where the bulk of the design will go before attempting the design on the ceiling. Before painting the design on the ceiling, give the surface a fresh coat of paint. It can be white, cream or even a light blue. Once the base coat dries, begin painting the design. It is best to start at the center of the ceiling and work out. This keeps the design relatively uniform and keeps it from being bunched up in one corner or on one side. If painting a mural with a lot of detail, sketch it out on the ceiling with a pencil first. After the design has been traced on, fill in the sections with acrylic craft paint. Anticipate that the task will take a large amount of time, because it can be difficult to keep looking up and back while painting. Unless the room is big enough to add scaffolding, you will spend many a night and day with your head tilted back. If you are stuck for inspiration, but want to add color, try sponging on puffy white clouds on a light blue ceiling background or painting thin willow branches with tiny yellow flowers that flow across a cream colored background. The addition of color to the ceiling should be elegant and flowing. Bright, harsh colors will make the room appear smaller and create an uncomfortable visual effect. Opt for light and cheerful when creating a colorful ceiling in the home.